The vast majority of radiator sellers show radiator output in terms of ΔT 50°. This is because ΔT 50° is the current European testing standard for modern boilers such as condensation boilers which have lower flow and return temperatures than older boiler systems which use ΔT 60°. So, in order to avoid radiators being incorrectly sized, it is important to know the heating system's temperatures and take them into consideration. It is also extremely important when calculating your rooms' requirements to know what basis you are using - for example, if your calculation is based on ΔT 50° and you choose radiators whose output is based on ΔT 60°, then the output of your radiators will be too low. 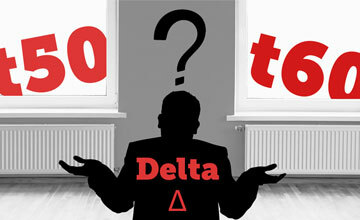 Example: Let's assume we have a radiator that gives 2000 Watts at ΔT (delta T) = 60°. At ΔT (delta T) = 40°, the output would be 2000 x 0.599 (from the table above) = 1198 Watts, At ΔT (delta T) = 20°, the output would be just (2000 x 0.256) = 512 Watts.